When people find themselves in a difficult place in life, it’s easy to feel hopeless. If we are suffering the consequences of bad choices, it’s easy to believe that God is shaking an angry finger and saying, “You made your bed, now lie in it.” People will say this, but God uses our mistakes to reveal His grace. The sins we believe are driving us away from God are actually driving us to Him. Then God stands with the promise that when our sins and failures abound, His grace much more abounds. 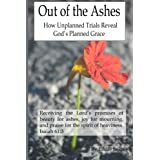 God delights in turning the ashes of our failure into the beauty of His love. What appears to be the pit of sin today will become the trophy of His grace tomorrow – if we put our trust in Him. Let God take your mess and exchange it for His perfection. God isn’t looking for righteous people. God makes people righteous. May this book help you discover the love God has for you.